The Banco de la Republica Argentina has issued (19th December) the two remaining coin denominations planned as part of their new series of re-designed and revised circulation coins and banknotes. The latest denominations are the $2 and $10 coins which feature a silk floss tree and a calden tree, respectively. 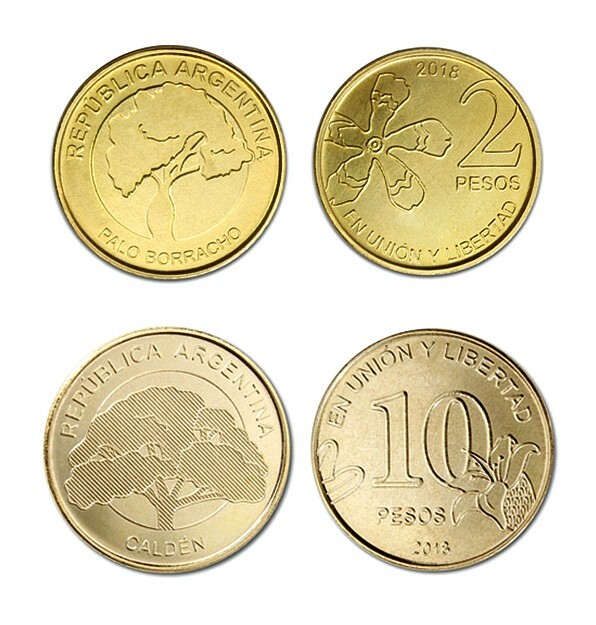 With these coins issued, the peso series entitled “Trees of the Argentine Republic” is now complete. The new coins of this series essentially replace banknotes of the same value, but will be used alongside these notes and older coins of lower denomination. The new coin series embarked upon by the Banco Central is part of a wider plan to standardise currency in circulation implemented through different measures, such as the launch of new 20, 50, 100 200, 500, and 1000-banknote denominations. The larger value banknotes were in response to the need for these denominations in daily cash transactions and cash handling. The requisites in the country for a revised monetary system of notes and coins also arose from the creation of an electronic platform mode of payment for consumers in addition to interbank exchanges of banknotes. The 2018-dated $2 coin is golden in colour as is the $10. 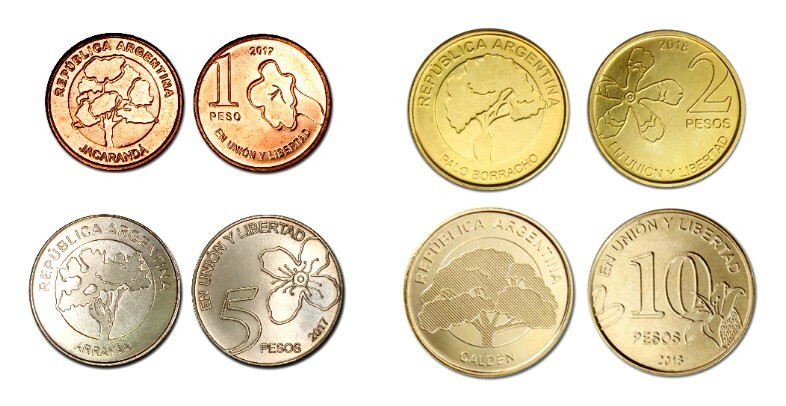 These coins are alternated with the $1 peso coin which is copper-coloured and the newly introduced $5 peso coin that has a silver colour. The lower three coins are struck in copper-plated steel, brass-plated steel, or nickel-plated steel. The $10 peso coin is struck from an aluminium-bronze alloy. The new larger value coins are intended to circulate alongside the banknotes of the same face value and will replace these notes as the notes are gradually returned to commercial banks due to wear and tear, in addition to the redemption of damaged banknotes. For more information about the new coins and new family of Argentinian banknotes, please visit the website of the Banco Central.